Let's start with setting up a very simple read only file server with Samba. Everyone (even anonymous guests) will receive read access. The first step is to create a directory and put some test files in it. In this example the samba server is a member of WORKGROUP (the default workgroup). We also set a descriptive server string, this string is visible to users browsing the network with net view, windows explorer or smbclient. You might have noticed the line with security = share. This line sets the default security mode for our samba server. Setting the security mode to share will allow clients (smbclient, any windows, another Samba server, ...) to provide a password for each share. This is one way of using the SMB/CIFS protocol. The other way (called user mode) will allow the client to provide a username/password combination, before the server knows which share the client wants to access. The share is called pubread and the path is set to our newly created directory. Everyone is allowed access (guest ok = yes) and security is set to read only. Here is a very similar configuration on Ubuntu 11.10. It doesn't really matter which Linux distribution you use. Below the same config on Debian 6, as good as identical. After testing with testparm, restart the samba server (so you don't have to wait). You can now verify the existence of the share with smbclient. Our pubread is listed as the fourth share. The final test is to go to a Microsoft windows computer and read a file on the Samba server. 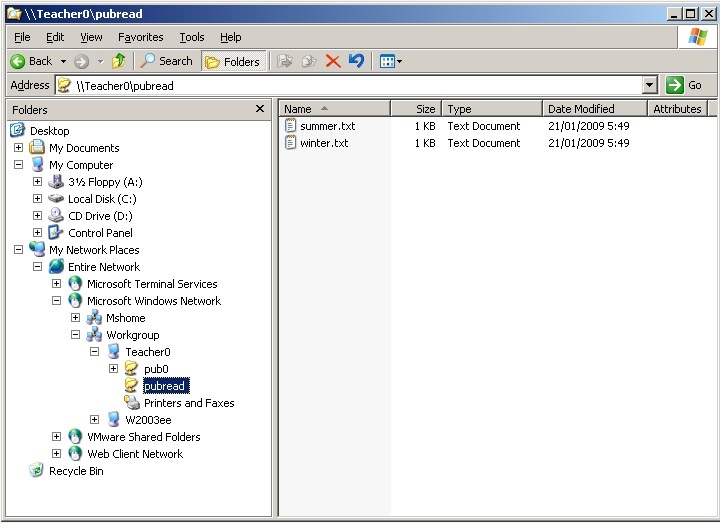 First we use the net use command to mount the pubread share on the driveletter k.
Then we test looking at the contents of the share, and reading the files. Just to be on the safe side, let us try writing. The Windows command line screenshot is made in a Linux console, using netcat as a pipe to a Windows command shell. The way this works, is by enabling netcat to listen on the windows computer to a certain port, executing cmd.exe when a connection is received. Netcat is similar to cat, in the way that cat does nothing, only netcat does nothing over the network. To enable this connection, type the following on the windows computer (after downloading netcat for windows). And then connect to this machine with netcat from any Linux computer. You end up with a cmd.exe prompt inside your Linux shell. 1. Create a directory in a good location (FHS) to share files for everyone to read. 2. Make sure the directory is owned properly and is world accessible. 3. Put a textfile in this directory. 4. Share the directory with Samba. 5. Verify from your own and from another computer (smbclient, net use, ...) that the share is accessible for reading. 6. Make a backup copy of your smb.conf, name it smb.conf.ReadOnlyFileServer. test with testparm before going in production!